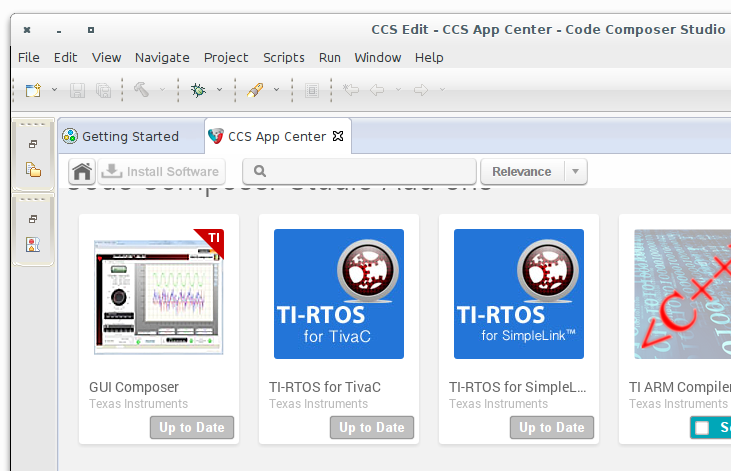 As of today, Code Composer Studio (ccs) 6 is only available for 32-bit Linux platform. The good news is that it can be installed on a 64-bit version of Ubuntu and Fedora. In this blog post, I’m going to show a few issues I came across and how to fix them on Ubuntu 14.10 64-bit. After the installation, when I ran the ccs, it produces some warning and error messages then quit. Now that ccs can be launched, but there are still some warnings. Here is another warning, which we can get rid of. This one is similar to the issue #3. This one is something to do with the App Center which only shows a blank page. According to the information found in reference , the internal web browser, chromium, could not launch because of missing libudev.so.0. Note that you must use libudev.so.1 provided by the 32 bit package.